Federal prisoners can get an education in prison. Programs offered include everything from GEDs to Bachelor’s degrees. Educational opportunities in the Federal Bureau of Prisons are somewhat limited, but still present, especially at the lower academic levels. Federal prisoners who lack a high school diploma or GED not only have the opportunity, but are required, to participate in classes that lead to the awarding of a GED credential. GED classes are much like scaled-down high school classes, but instead of each class being subject-specific (e.g., Biology or Freshman English), they are more general (e.g., English, Science, Social Sciences, Math, etc.) and with students with a wider range of academic abilities (e.g., elementary school, middle school, high school, English-as-a-Second Language, etc.). If you don’t have a high school diploma or a GED you can sign-out if you want, though you will be penalized for doing so. This can result in being restricted to the lowest pay grade and reduced good conduct time provisions. For those who already have a high school diploma or GED, they have the opportunity to participate in adult continuing education (ACE), vocational training (VT), apprenticeship, parenting classes and other seasonal programs (e.g., job fairs). Note: Some facilities restrict ACE class eligibility to those who already have a high school diploma or GED, while others permit all prisoners to sign up for ACE classes. The larger barrier, though, is classroom space. Often such classes, which can consist of writing, business, accounting, Spanish, and other topics, have long waiting lists. Generally speaking, education seats are very limited and the credential most often issued is a certificate from the Federal Bureau of Prisons, not a true credential, with the exception of a GED certificate. GED and ACE classes are more often than not taught by fellow prisoners who handle all teaching duties. While staff educators will sometimes engage in actual teaching, in the Federal Bureau of Prisons they are more likely to take attendance and leave, leaving inmate tutors to handle all teaching responsibilities. In addition to such programming, federal prisoners also have access to library services, which include fiction and nonfiction books, along with various periodicals and movies, which can be watched on televisions made available to the inmate population. Whereas all a federal prisoner has to do to check out a book or magazine is to walk up to a counter and ask to check out a particular book (which they can then keep for a week or two), movie viewing is based on a sign-up sheet. Most prisons permit inmates to sign up for two, one-hour time slots per week, availability permitting. Newspapers and magazines can also be checked out, but must be returned prior to leaving. 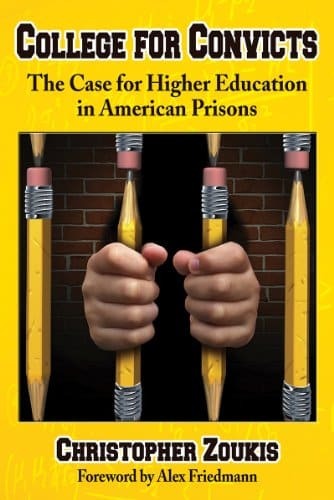 With the exception of free Bible studies, prisoners must pay all costs associated with any such correspondence education program, which can run from a few hundred dollars per career program to upwards of $1,000 per college course. While the prison administration will provide the most basic levels of education for free, anything above this generally must be completed via correspondence education, at the prisoner’s own expense. But, with some effort, and a bit of funding, virtually all levels of education and training are available to those so inclined. As a case in point, one of the Zoukis Prisoner Resources team members earned not only a bachelor’s degree, but his MBA while incarcerated. To learn more about correspondence education for prisoners visit PrisonEducation.com or pick up a copy of the Prison Education Guide, which profiles every correspondence program accessible to prisoners. Contact us for more information on prison education or other topics related to life in prison.